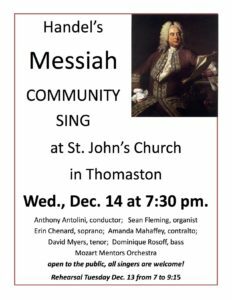 Notes: The Episcopal Church of Saint John Baptist presents its annual “Messiah” sing on December 14, 2016 at 7:30 p.m. at St. John’s in Thomaston. Anthony Antolini conducts and Sean Fleming accompanies, joined by members of the Mozart Mentors orchestra. “Messiah,” the most well-known of George Frideric Handel’s works, relates the story of the life of Jesus. Perhaps the most famous portion of the work is the “Hallelujah” chorus. This holiday classic is a wonderful way to bring in the holidays. The Mozart Mentors Orchestra, in its eighth season, is made up of Maine string teachers and their top students, ranging in age from 10 to 18.